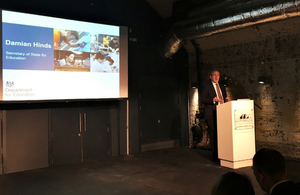 Britain must drop its ‘snobby’ attitude to technical and vocational education or risk being left behind after Brexit, Education Secretary Damian Hinds warned in a keynote speech to business leaders today, Thursday 6 December. As the government marks the one year anniversary of its modern Industrial Strategy which aims to boosts the nation’s productivity and put the UK at the forefront of the AI and data revolution, the Education Secretary set out his plans to get more people into skilled jobs that command higher wages. The Mayor of London has published the Skills for Londoners: A Skills and Adult Education Strategy. The Mayor will seek to utilise the remaining European Social Fund allocation in London and lobby to ensure it gets a fair funding settlement in the UK Shared Prosperity Fund. City Hall will scope and establish new pilot programmes to promote and facilitate the use of levy funds to improve progression, increase social mobility and raise the productivity. The Mayor will seek to address the under-representation of women and BAME Londoners through programmes such as the Mayor’s Construction Academy and Digital Talent programme. The Mayor will continue to support investment in infrastructure and facilities in further education through the Skills for Londoners Capital Fund. The Mayor will create a London Skills and Employment Knowledge Hub, an online platform, which will gather, publish and present relevant employment and data at regional and sub-regional level. Alongside this strategy, the Mayor is publishing the Skills for Londoners Framework, which sets out funding priorities for the AEB in London as well detailed proposals for overcoming barriers to participation and achievement in adult education. Delays and skills shortages are making recruiting staff with the right skills for the job so difficult, it is costing British businesses £1.7 billion a year, highlights the first of a series of Skills Shortage bulletins published by the Edge Foundation. The latest data from the British Chambers of Commerce (BCC) Quarterly Economic Survey of over 7,100 businesses shows that skilled manual labour is the most problematic area of recruitment; 68 percent of firms are struggling – the highest since records began. ‘All the evidence indicates that UK plc is facing a recruitment crisis. Altogether, 203,000 people with Level 3+ engineering skills are needed to meet expected demand, but we are seeing skills shortages right across the board and in all kinds of jobs. In construction, the next three to five years will see a 90 per cent increase in demand for management skills while 68 per cent of building firms are struggling to recruit bricklayers.